The Electrolux Group is the world's largest producer of powered appliances for kitchen, cleaning and outdoor use, such as refrigerators, washing machines, cookers, vacuum cleaners, chainsaws, lawn mowers, and garden tractors. Since 1919, Electrolux's innovative solutions have made life easier and more enjoyable for millions of people all over the world. Every year, customers in more than 150 countries buy more than 55 million Electrolux products for both consumer and professional use sold under famous brands such as AEG, Electrolux, Zanussi, Frigidaire, Eureka and Husqvarna. 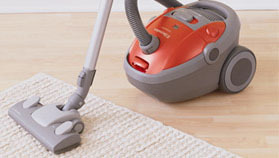 The Electrolux Group has pioneered the development of the modern canister-type vacuum cleaner. It all started with the Lux 1 and has led to the Electrolux Group becoming the world's number one choice within kitchen, cleaning, and outdoor appliances!